Latvian politicians started raising the prospect of an independent country in 1917. To be sure, there were squabbles – who wouldn't want the honor of having brought a new state to being? One of the contestants was the so-called Democratic bloc, a Rīga-based union of parties. The second was the Latvian Provisional National Council, established in Valka mostly by delegates of local governments, the land councils. The National Council declared itself the only true representative of the will of the people and Latvia an autonomous, individual state entity. The National Council did not demand Latvia's independence yet. First of all, it did not control the Latvian territory and was de facto an underground organization mostly active in Petrograd (current St. Petersburg). The German army ruled over Courland and Rīga, while Vidzeme and Latgale was in the hands of the Bolsheviks. Secondly, the council thought only an elected parliament could decide the fate of Latvia, namely whether it is to become independent or remain with a foreign power. The situation changed in 1918. Lenin's Russia withdrew from the war, and the Baltics, with the exception of the Latgale cultural region, were given to Germany. The land-owning elite (mostly Baltic Germans) proclaimed a client state, the Duchy of Courland and Semigallia, offering the throne to the German Kaiser Wilhelm II. Later, including Vidzeme and Estonia, it became the Baltic Duchy, an abomination which Wilhelm II declared a "free and independent state". The Latvians grasped that they could not become caught up with either the Germans and Russians; and that they must swiftly declare independence and seek support among Western allies. In July 1918, authorized by the National Council, statesman Zigfrīds Anna Meierovics went to Stockholm. Zigfrīds Anna Meierovics (1887–1925) was not only the first Foreign Minister of Latvia, but also the very first Latvian diplomat at the time when Latvia didn't even exist yet. In summer 1918 he arrived in London under the authority of the National Council. In the fall of the same year, Latvia celebrated its first diplomatic success. He carried a small luggage, including political documents and 500 pounds sterling (worth about 25,000 today) as well as six ornate volumes of Latvian art to give to important people. A young finance employee, Meierovics was aged just 31 but had already proven himself as a brilliant diplomat. He opened a Latvian information center in Stockholm and met the press and politicians. Of particular importance were potential British contacts, as he would next venture to the UK, which was the foremost Allied country in Europe. 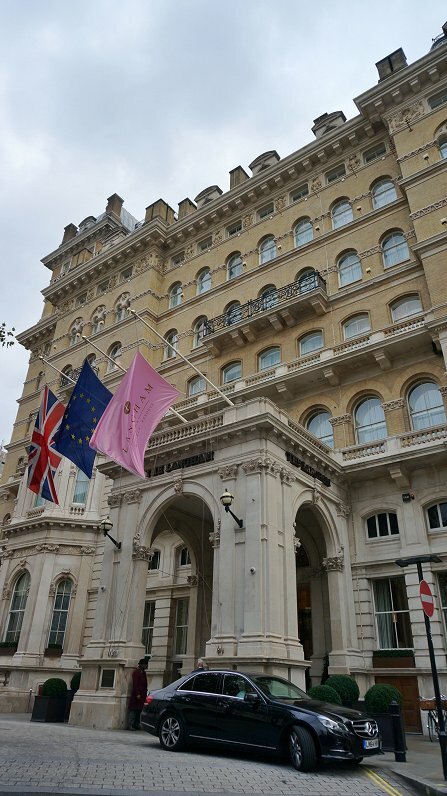 On August 12, Meierovics arrived in London, choosing the elegant Langham on Regent Street as his place of residence. This hotel is considered the first diplomatic residence of Latvia, but at that time there was no Latvia to speak of, yet. Meierovics visited the Foreign Office countless times. To score a chance of meeting the Foreign Secretary, Meierovics had to convince officials that their unfavorable, Russia-promoted views of Latvia were unfounded. Tsarist diplomats were still respected in London. The Bolshevik uprising had only just taken place and the world thought that Lenin would not last. Meanwhile the murdered Tsar Nicholas II was the cousin of George V, and that's also a reason why the Brits thought the old Russia could still return, and Latvia remain a part of it. No, the majority of Latvians are not Lenin's riflemen. No, Latvians are not friends of the Baltic German landowners. And Latvians are not "half-Slavic, half German". Meierovics even had to prove he was not about to be tried as a traitor in Russia. He produced copious amounts of drafts to the Foreign Office on the Langham hotel stationery. Finally the suspicion gave way, and Meierovics received an audience with the Foreign Secretary. On October 23 at 4.36 p.m., the young Latvian man was accepted by Arthur Balfour, the 1st Earl of Balfour. During the short discussion, Meierovics tried to convince the Brits that they cannot cede Latvia neither to Russia nor Germany. It was easy enough as concerns the Germans, the Commonwealth's enemies who were about to lose the war anyway. Meierovics took a hard line against Russia, saying it had never had any other rights to Latvia except those of an invader. These had now been lost, and the Latvian matter was of international importance. Furthermore, no racial, national, cultural, religious or social ties bind Latvians with Russia and the Slavs, the Latvian statesman said. Having heard Meierovics out, Balfour asked whether Bolshevism won't overtake Latvia if it makes peace with Russia? No, it won't! - All right, then. The British Foreign Secretary promised to see to it that Latvia is not added to Germany. Until the peace conference after the end of the war, the Brits accept to take the National Council as the temporary Latvian government and Meierovics as its informal diplomatic representative. The discussion lasted for just twenty minutes, but these were the most important twenty minutes for the birth of Latvia. For the first time in history, one of the world powers talks about Latvia as a state, using the words "government" and "diplomatic representative" – and that was almost a month before Latvia's independence was declared! 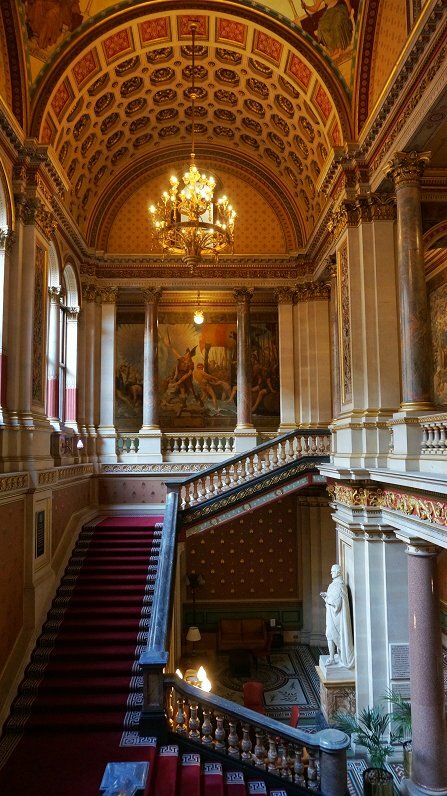 This ornate staircase leads to the British Foreign Secretary's audience hall. 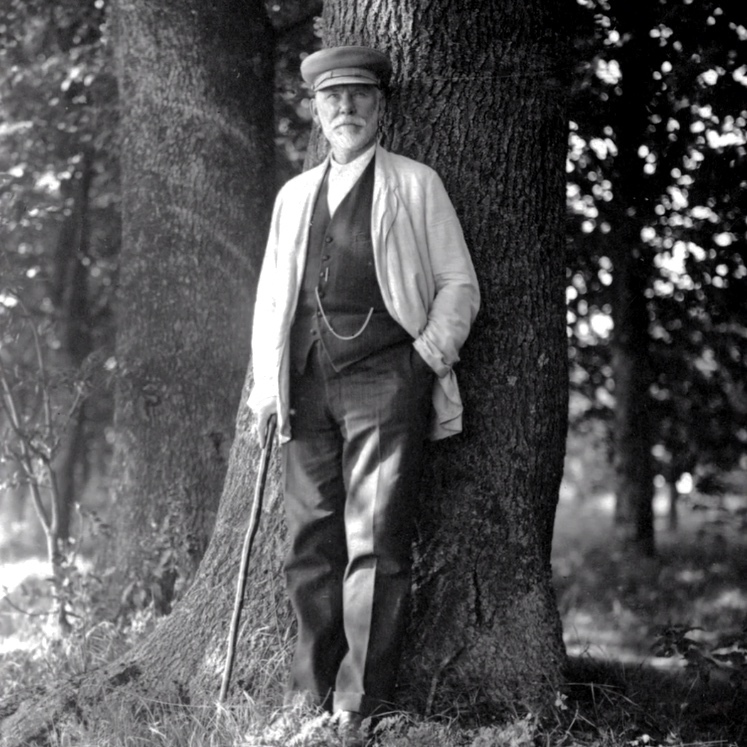 It is likely Meierovics ascended the stairs a hundred years ago visiting Arthur Balfour. The Balfour memorandum, the first document to recognize Latvia's de facto independence, was inked a few days later. The world was a veritable boiling kettle back then. The war was rapidly approaching the end. The Germans tried propping up their proposed Duchy in Rīga and planned a suicidal naval attack on London, but just a few days passed and the Kaiser was toppled in a revolution. Meierovics understood that oral promises can become forgotten in a mess like this and therefore asked Balfour to confirm his guarantees to Latvia. On November 11, the most important day of the war, the British Foreign Office found time to reply to the Latvians. This is called the Balfour memorandum (Latvian: Balfūra nota). Politically, it meant Latvia's independence was recognized de facto. The Latvians themselves followed suit a week later. Meierovics learned about the November 18 declaration only later in London, and only later he also learned that political squabbles had cast a shadow on the declaration and that the British-recognized National Council was practically disbanded. The Democratic bloc, especially the social democrats, were categorically against the idea that the National Council would proclaim Latvia's independence. After long-drawn debate, the two organizations set up a joint People's Council of Latvia (Latvian: Tautas padome), which became the body to declare Latvia's independence. In absentia, Jānis Čakste was elected its chairman. But he did not even attend the November 18 declaration. Historians say all the intrigues probably made him bitter. Meierovics likewise did not celebrate on November 18. He had moved to a rental apartment and was working on that day, inviting London's Latvians to a Latvia-themed event where "Latvia's chances and tasks for the future" would be discussed. The chances were still tiny, and there were a lot of things to do. The next day, Latvians understood that they had not gained freedom just like that, miraculously. The Freedom Battles, both in the trenches and in diplomatic saloons, were still waiting to be fought. 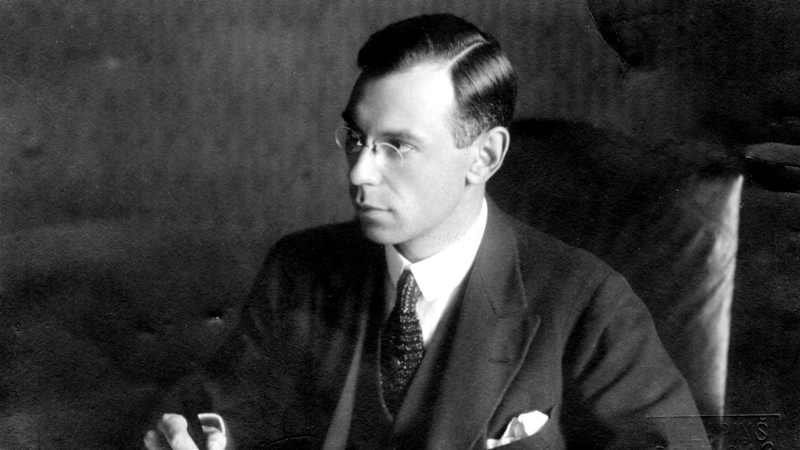 Jānis Čakste was an authority figure and the closest political ally to Meierovics. Pointedly, neither of the two participated in the declaration of independence on November 18. Meierovics was still in London, but Čakste was probably offended by political intrigues surrounding the great event. Later, both of them headed the Latvian delegation in the Paris peace talks. In January 1919, when the Latvian Provisional Government was chased by the Bolsheviks in Liepāja, Meierovics had become Foreign Minister and was visited by Jānis Čakste. The two went to Paris, where the peace conference was held, and it was the Latvians' hope to achieve international de iure recognition there. They did not know that their battles in Paris would be longer than those happening in their homeland. Not many hearts were won over to the Latvian cause, despite British de facto recognition. Even worse, the British had a new Foreign Secretary. Namely, George Curzon, a fervent opponent of Balfour's who regretted the Brits' earlier favor to the Latvian cause. The world still hoped Russia would get rid of Lenin. The civil war had broken out, and in Paris everyone hoped the Whites would prove victorious; well, at least everyone who was not trying to break away from Russia. The great powers had various reasons to hope for the re-emergence of the Russian Empire. The Brits wanted a counter-force to leftist Germany. The Americans wanted a force against an aggressive Japan. Meanwhile France wanted to recoup the huge wartime credits extended to Russia, which Lenin was not of the mind to return. Therefore everyone was of the opinion that the fate of the former empire's small nations would have to be decided by the Russian parliament once it would reappear. The Paris conference ended a year later. Latvia had fought for its land, elected its own parliament and concluded peace talks with Russia. But even that was not enough. Everyone waited for the Russian war to end. Latvia was not recognized de iure as it was not a member of the League of Nations. But it was not accepted to the League of Nations as it was not recognized de iure! There was talk in Latvia that, as a small nation, we can make do without this league. Meierovics was of a different opinion: "There are neither big, nor small nations on the world map. The greatness of the nation is determined by its national consciousness and the reach of its spirit!" Nevertheless the greatness is also determined by the ways of the world at large. Only in late 1920 did the world start taking on a shape that would be favorable to Latvia. It was clear that Lenin is winning the civil war. The Entente allies became more lax. Meierovics had succeeded in winning French and Italian support. In January 1921 the Entente's higher-ups met, with Italy asking to put Latvian and Estonian independence on the agenda. The Brits vetoed this, but Aristide Briand nevertheless put it in the list of debate topics. 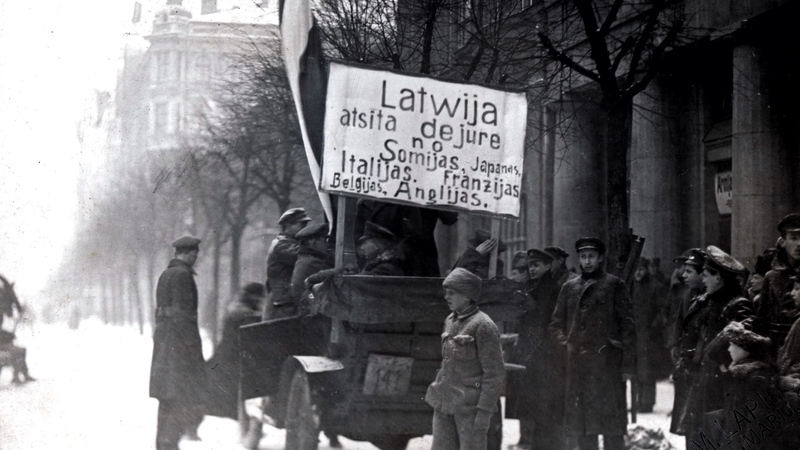 The opponents had nothing more to say, and on January 26 the Entente finally recognized Latvia de iure. A great celebration was held in Rīga, but Meierovics was not there to see it. The fight for Latvia being recognized de iure lasted longer than the actual Freedom Battles in trenches across the country. Meierovics had to remain vigilant for two years to find the right moment when the great powers' interests would fit those of Latvia; we would become a fully rightful state only on January 26, 1921. "If we'll be given twenty years of independence while being on our own, you can say that we'll have had a long life," he said, prophetically. It was 1922 and Latvia would be invaded 18 years later. Of the 38 councilmen that had participated in the proclamation, 26 survived until the occupation. Half of them faced repressions, and ten were killed while three of them survived. A further eight went into exile. The Latvian state had existed for 22 years, less than today after the renewal of independence. Of its 100 years, Latvia has been independent just 49. Nevertheless we're lucky to have lived to see another declaration of independence. It helps us to appreciate the first one all the more. Just like November 18, May 4 was just a single, short day that was part of a long battle. It took almost three years of national awakening and one and 18 months of barricades for the declaration to come true. As Latvia celebrates its centenary this year, we are urged to remember we're not celebrating just a single day, and we're not celebrating even a full centenary of independence. We're celebrating our way towards it, and the good that will surely keep coming after that.